This Swiss-designed Automatic Milk Frother by Jura is built to save time, effort and clean-up by providing you with the perfect milk for your favorite drink at the flip of a switch. No more screeching steam wands or burnt fingers. This handy mini-appliance brings peace and piece of mind so you can concentrate on crafting a great drink! Pairs perfectly with the Jura ENA Micro 1. Hot and Cold Frothing - Froth your milk to the temperature you want with three pre-set temperatures. Easy to Clean - The stainless steel pitcher and inserts are top shelf dishwasher safe and a breeze to clean. 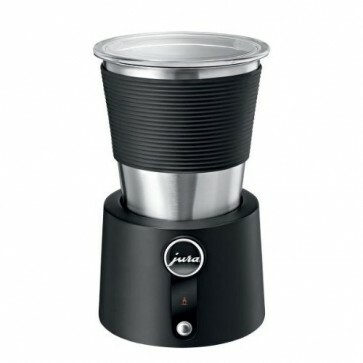 Auto-Off - You can walk away with confidence since this frother shuts off automatically. Get A Grip! - To change between the whisk disk and the heating disk you will need a very forceful tug. Perched - The plastic lid perches on top and does not create a tight seal, so take care not to overfill. The Jura Automatic Milk Frother has a coated stainless steel pitcher rather than a glass or plastic pitcher. Dishwasher safe removable stainless steel pitcher.